Company formation (n, m): the term for the process of incorporation of a business. It is also sometimes referred to as company registration. 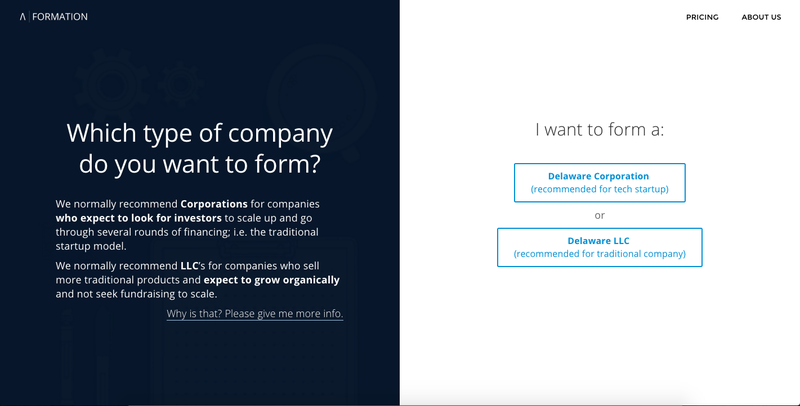 I’m proud to introduce Stellar Formation, a website made to help you form your US company (Inc. or LLC) in minutes, clear and simple. This is a new Stellar Base project. As a repeat founder, I’ve been through incorporations. I’ve worked with expensive lawyers, cheap lawyers and online services. The problem, always, is this: once my company is set up, I still don’t understand how it works. The education is missing. When you start a business, you need to understand it. It shouldn’t be this shiny black box that this gifted and intimidating craftsman (a lawyer) made for you. You should understand the ins and outs because you’ll own it and will live in it for a while. I know many repeat founders who, because they had a hands off approach with a lawyer; still don’t fully understand the key elements of their business years after formation. Another typical case is they need to reform their business with an expensive lawyer a few months into their business because they did something wrong the first time. That’s why we built Stellar Formation. If you’re starting a business, especially an agency, consultancy, startup, do it with Stellar Formation. Today, we can create your Corporation (.Inc) or LLC in Delaware which covers the needs of 90% of new businesses. We’re looking forward to making the hard legal process of incorporating your company easy, educational and fast. Maxime, Kenneth and Spencer from Stellar Base.